What’s the best solar panel? Solar panels are the engine behind generating clean electricity for your home, business or community, so choosing the right solar panel for your project is a critical part of system design. There is, however, a lot to consider! 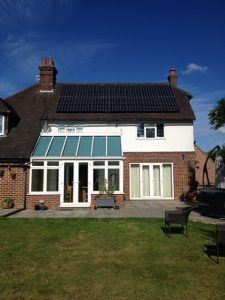 We’re often asked “what’s the best solar panel?” but there’s no simple answer to that question as there’s so many different criteria by which a panel could be judged. Solar panel efficiency, brand, reliability, price, appearance and warranties can all be considered important. It’s a bit like asking “what’s the best sandwich?”. There’s no such thing as “the best sandwich”, but there are a range of things you’ll take into account when buying your lunch. Taste, price, size, whether its vegetarian, gluten free, low fat, or spicy could all play into the decision making process. It’s the same with solar panels, so here we talk you through the major considerations to help guide your choice. The first consideration for most people is the cost of solar panels. Here, the market neatly segments into 3 different categories, with comparatively little to choose between modules in each category. Cheap solar panels are crystalline silicon modules of standard efficiency of about 16%. They tend to be used for commercial and community projects where the lower price is needed to make the economic case for investment. They are also used for residential projects where the customer looking to minimise costs. This segment of the market is dominated by Chinese manufacturers, who now make more than ½ of all modules worldwide. Most of this is of very good quality, but it’s fair to say the phrase “Chinese manufactured” does carry some preconceptions. There are some very cheap, poor quality Chinese manufactured solar panels out there, so we need to be careful. That’s why we choose our brands very carefully, as we explain below. At the more expensive end of the market are high-efficiency modules, which can reach conversion efficiencies of 22%+. These are technically more advanced products, and come with a cost premium. However, they are an excellent choice for customers who want to purchase the latest, most high tech product. We are increasingly seeing customers wanting to generate as much electricity as possible from their rooftop, especially when they are looking to power an electric car as well as their household loads. We also use them a lot for small rooftops as the economics are better. Where a lot of the cost of the system is getting up to the rooftop (e.g. scaffolding), it’s better to put in a higher efficiency, higher capacity system once we’re up there. 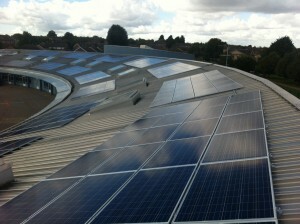 We’ve blogged in more detail about high efficiency panels here. The intermediate price band is characterised as standard efficiency modules, made by European or Japanese manufacturers. We are not seeing a lot of demand in this segment, as they are technically similar to the cheap solar panels but at higher cost. However, we can supply these if requested. Trusted major companies like Sharp are still making great product. A word on thin-film products. Those of you reading around may have come across a type of modules called thin film solar panels. These are not made of crystalline silicon but use a variety of other materials including cadmium telluride, copper indium diselenide or amorphous silicon. They have been proven to give more electricity under low light conditions in the UK (by our own Dr Chris Jardine, no less!) but overall they are less efficient than conventional modules. Because of their lower efficiency they are not really used worldwide, and certainly not on rooftop applications. So despite some appealing characteristics, they are a bit of a red-herring. Having outlined the different categories of PV panels, the question is how to choose the product to use. This is easy – our experts select the best product in each category, so you don’t have to. We do this by assessing across multiple criteria. Brand value – In order to choose a trusted product, we choose from well-respected brands. Most people purchasing solar panels wouldn’t recognise the names of the manufacturers, as they are not usually household names. Fortunately, the research organisation company Bloomberg New Energy Finance analyse the market each year, and produce a list of high quality (so called Tier 1) modules. They assess bankability – which brands of panels are used in (large scale solar) projects that banks are investing in. If banks are willing to put their money at risk on a product, it’s a good measure of quality, as they will have done their due diligence. Joju only use Tier 1 products. Module testing – Industry trade magazine Photon International run a large test site monitoring the performance of different brands of solar panels. We check the outdoor performance of our chosen modules so we know they perform well in real life. Warranties – the length of warranty is also an important indicator of quality. Most modules come with a 10-year product warranty (guarantee that the module won’t break), although some manufacturers such as Sunpower offer a 25 year product warranty. On top of this, the modules come with a performance warranty, guaranteeing a certain percentage of output after 25 years. Typically manufacturers guarantee that the module will be producing 80% of its nameplate efficiency after 25 years, although some manufacturers will offer higher values. We also check that these warranties are insurance backed by European insurers. Installer feedback – We rely on feedback from our installation teams about the product they are installing. Historically, we have stopped installing some brands, as our installers felt they were too flimsy. Ethics and sustainability – these are important considerations for us as a green business in choosing the products we offer. We ensure all our modules are guaranteed conflict metals free. We’ve also written about wider ethical and sustainability issues in more detail for Ethical Consumer magazine. Efficiency – Efficiency is more important in choosing the category of solar panel (cheap solar panels vs. high efficiency panels), as within each class there is little variation between similar modules. Cheap solar panels will give you the lowest system price, whereas high efficiency panels will maximise generation and income over the system lifetime. One further consideration is what the solar panels will look like on the roof. Solar panels consist of a grid of individual solar cells, mounted under glass, encapsulated with a resin backsheet, and surrounded by an aluminium frame. Most modules will have black cells, with a white backing sheet and silver frame. 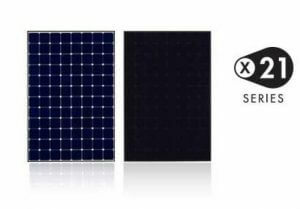 However, it is also possible to purchase all black modules (sometimes called black-black solar modules), which use a black encapsulation and black frame. This gives the modules a more uniform look, and the systems tend to look neater. They are especially attractive when mounted against slate, or recessed in line with the roof. There’s a small price premium here of about £10 per panel. An alternative to solar panels is to use solar roof tiles, where the solar collector is the roof covering material itself. We constantly review the market for new products as technology and price changes, but here are our current most commonly-used modules. Cheap solar panels – JA Solar is a world leading manufacturer of high-performance solar power products, ranking as the 4th largest manufacturer worldwide in 2015. Their panels are recognised for yield efficiency, and reliability to enable customers to maximize the returns of their PV projects. As such they are an excellent choice for optimising performance at low cost. JA also produce an attractive “all black” solar panel. High efficiency – Sunpower manufacture the most efficient modules on the market. Modules come with industry leading, 25-year product and performance warranties, and are also available in all black versions. We also offer LG as an alternative high-efficiency module in some cases. LG are a Korean manufacturer of solar panels and a global pioneer in electronics technology. Their modules integrate better with some mounting systems, especially on flat roofs. Other solar panels – We are happy to source solar panels of other brands if you have any specific requests. 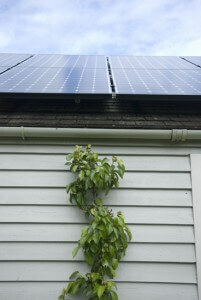 You may, for example, want your solar panels to match those of your neighbour! 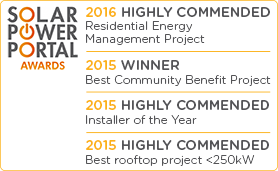 Find out more about our solar panel offering…. … and how we deliver a project in your home.